I have been planning for a while to make my own boiled linseed oil to make printers ink, and I have finally gotten around to it. Over the weekend, my wonderful husband and two fantastic friends (Thank you Andrew, Laura, and Karl!) and I got together to have a picnic, boil some linseed, and generally see how much trouble we could get into. Unlike ink used for calligraphy, printers ink needs to be very thick so it sits on top of the type rather than running down into cracks. It also needs to transfer cleanly from the type to the paper. Early printers looked to painters rather than calligraphers for inspiration for ink. There was a varnish used by painters made from boiled linseed oil from the 14th century that is described in “Il Libro dell’ Arte (The Craftsman’s Handbook) by Cennino D’ Andrea Cennini’s. 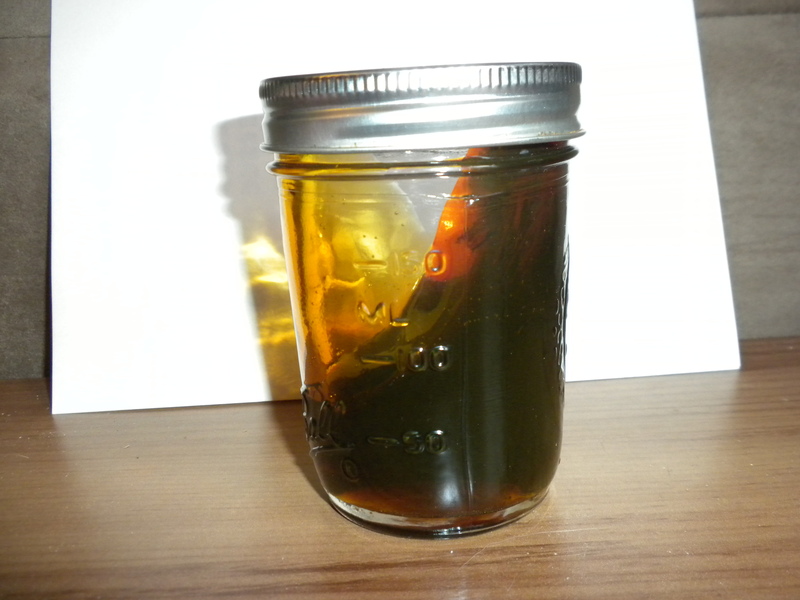 You ought to know how to make this oil, since it is one of the useful things which you need to understand; for it is used for mordants, and for many purposes. And therefore take one pound, or two, or three, or four, of linseed oil, and put it into a new casserole; and if it is a glazed one, so much the better. 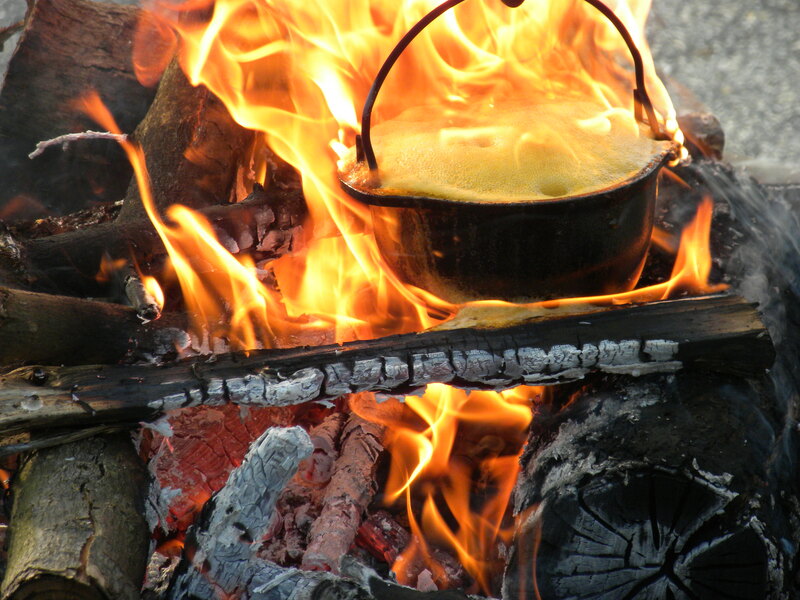 Make a little stove; and make a round opening so that this casserole will fit into it exactly, so that the flame cannot come up past it; because the flame would be glad to get to it, and you would jeopardize the oil, and also risk burning down the house. When you have made your stove, start up a moderate fire: for the more gently you make it boil, the better and more perfect it will be. And make it boil down to a half, and it will do. But to make mordants, when it is reduced to a half, put into it one ounce of liquid varnish which is bright and clear for each pound of oil; and this sort of oil is good for mordants. Boiling linseed oil is tricky and very dangerous. The boiling point of linseed oil is 316 oC and the auto-ignition point (the temperature at which the oil can combust without an ignition source) is only 343 oC. 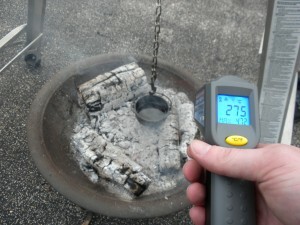 This means that if the temperature is not carefully regulated, it can lead to a fire, as I found out. 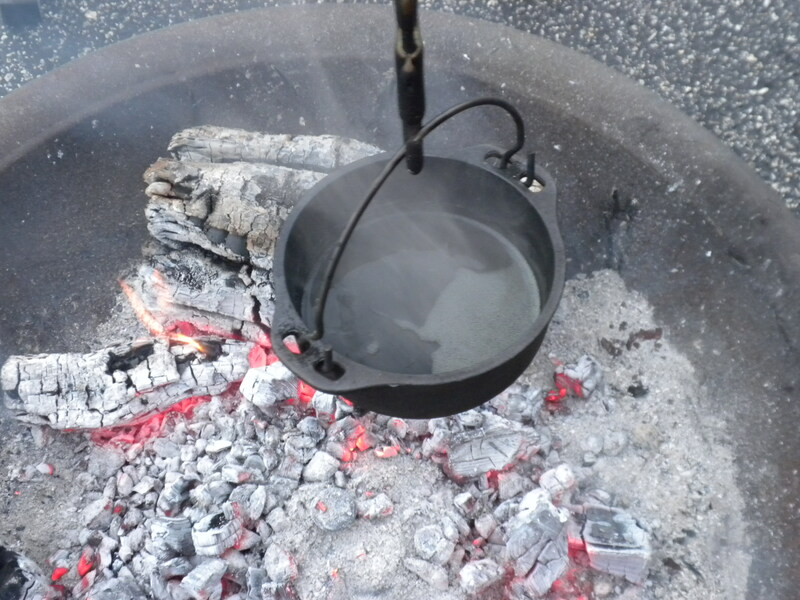 The vapors coming off hot linseed oil will ignite at 222 oC, so you also have to be very careful to keep the flames far away from the pot. Early printers would make their own ink. They would travel out into the countryside with their families, assistants, and apprentices and have a picnic while boiling the oil. I believe that as the demand for ink and printing grew, there wasn’t time for the process to take up an entire day away from the cities, so the process became more dangerous. Moxon talks about ink making in his, Mechanick Exercises published 1683. Although this is post-period, I believe the the sentiments are very period. The providing of good inck, or rather a good varnish for inck, is none of the least incumbent cares upon our master printers, though custom has made it so here in England; for the process of making inck being as both laborious to the body and, as noysom and ungrateful to the sense, and by several odd accidents, dangerous of firing the place it is made in, our English master printers do generally discharge themselves of that trouble; and instead of having good inck, content themselves that they pay an inck maker for good inck, which may yet be better or worse according to the conscience of the inck maker. I knew that this was a fairly dangerous experiment, so I took precautions and only attempted to boil a small amount of oil at a time. I also did the project at a friend’s house which is also used as our shire’s archery range. 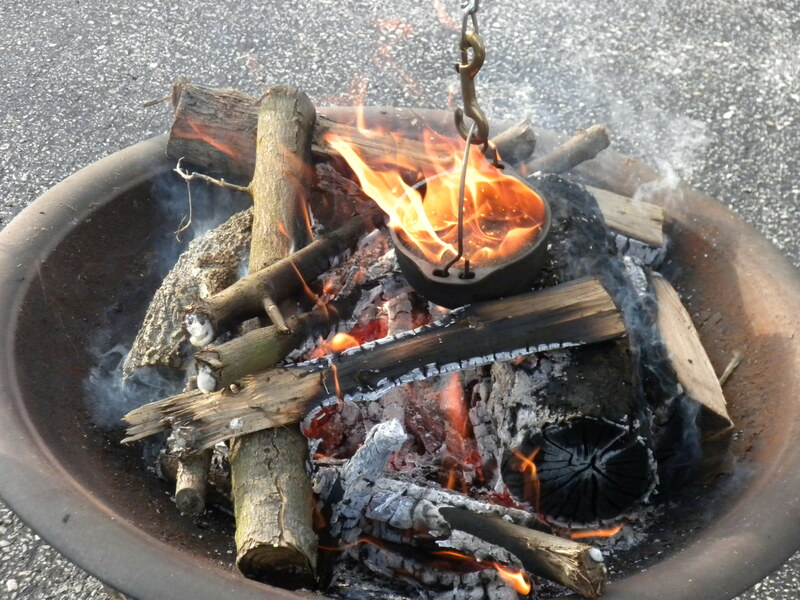 I used an above ground metal firepit for the fire and hung the small cauldron containing the oil from a ladder, which gave some extra flexibility with height and the ability to easily raise and lower the cauldron. For the oil I used food grade Flaxseed Oil (which is what food grade linseed oil is called in the USA). This product is cold pressed and available at health food stores. I figured that this would be as close to period linseed oil as I would be able to purchase. Raw linseed oil available from the hardware store has undergone a very high pressure extraction that destroys some of the components of the oil. Here is my first attempt to make linseed oil. 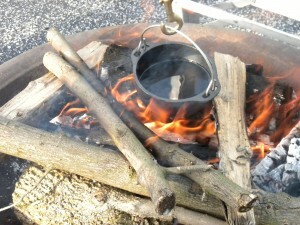 First I hung the pot over the fire. At this point the fire was going pretty well and had not burned down to coals yet. Additionally, the pot is hanging fairly low. 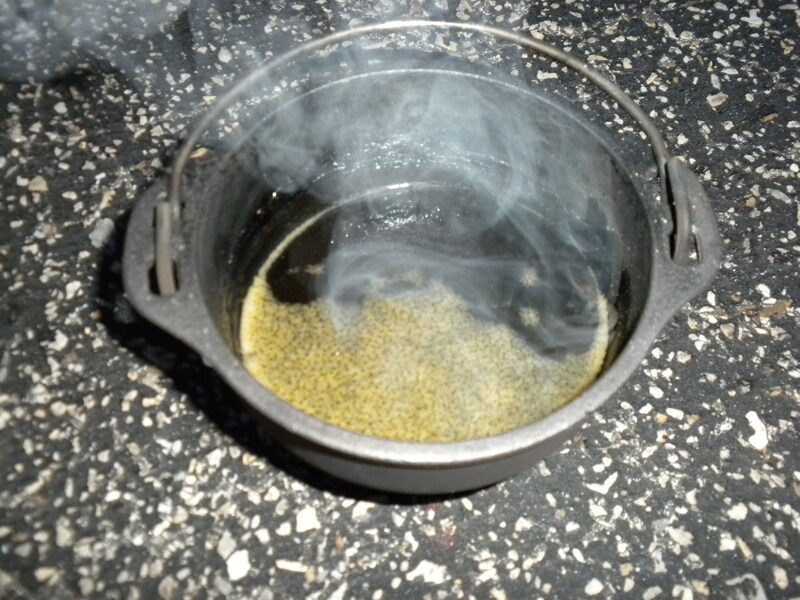 After not too much time, the oil pot started smoking. Initially, I thought this was possibly water being removed from the oil. I did not think it had reached the boiling temperature that quickly. Moments after it started smoking, the oil caught on fire. 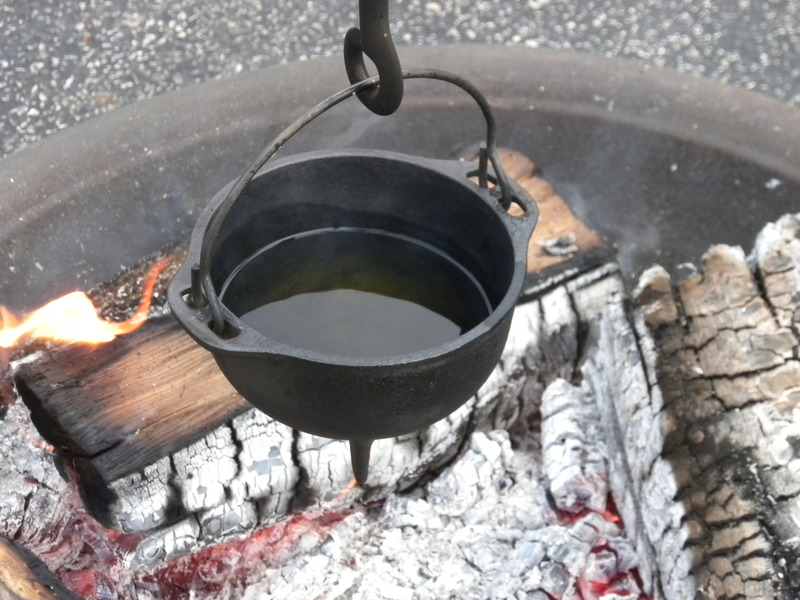 I do not know if the temperature reached the auto-ignition point, if the flames actually got into the pot, or if the vapors ignited and brought the flamed into the pot, but either way the oil was on fire. 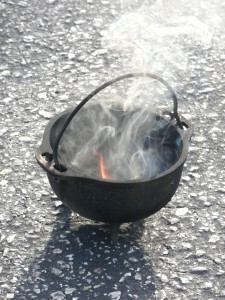 The oil in the cauldron caught on fire. Soon after the oil caught fire, it began to foam up and overflowed the cauldron. This led to an impressive fireball. 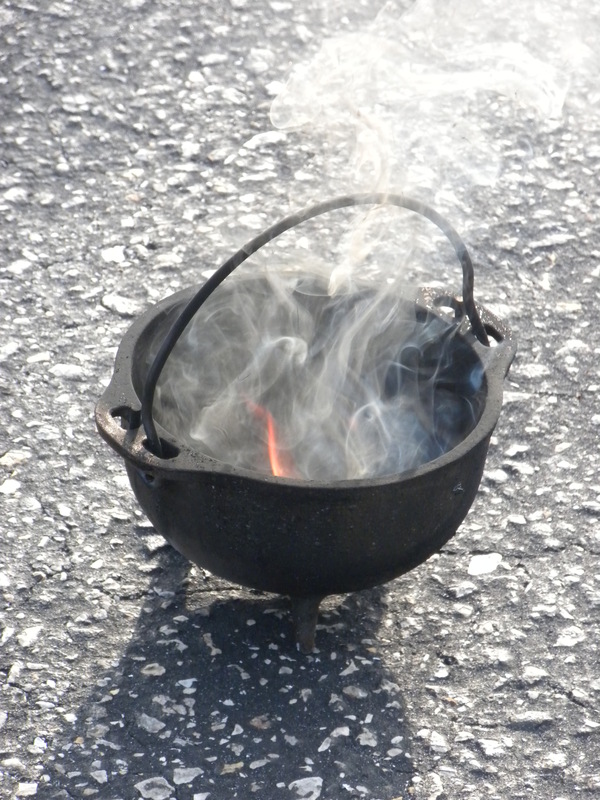 Once oil foamed over the sides of the cauldron, there was an impressive fireball. A close up of the foaming linseed oi. I only had a small amount of linseed oil, about a cup, in the cauldron, so it the large flames died down pretty quickly. 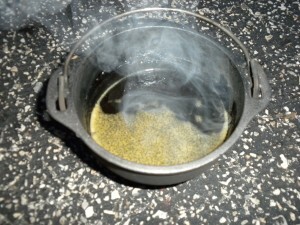 The rest of the oil in the cauldron burned off after I had removed the cauldron from the fire. After being removed from the fire, the last of the linseed in the cauldron burned off. I let the cauldron cool for trial 2. I learned a lot from this trial. Of most interest to me was how the linseed oil catching on fire led to a large fireball. I knew from the literature that making boiled linseed oil was dangerous and could cause the place it was made in to burn down, but I wasn’t sure why it would be worse than just the oil burning. Now I know that once the oil catches, it can quickly lead to a huge fireball. For the second test, I waiting until I had a good batch of coals and very little flames, and I used an infrared thermometer to check the temperature constantly. I was also much more careful about the height of the cauldron. 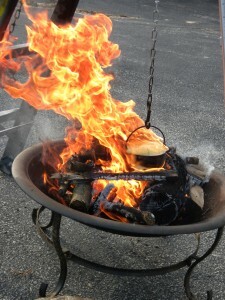 The linseed oil was suspended over hot coals, with few flames. 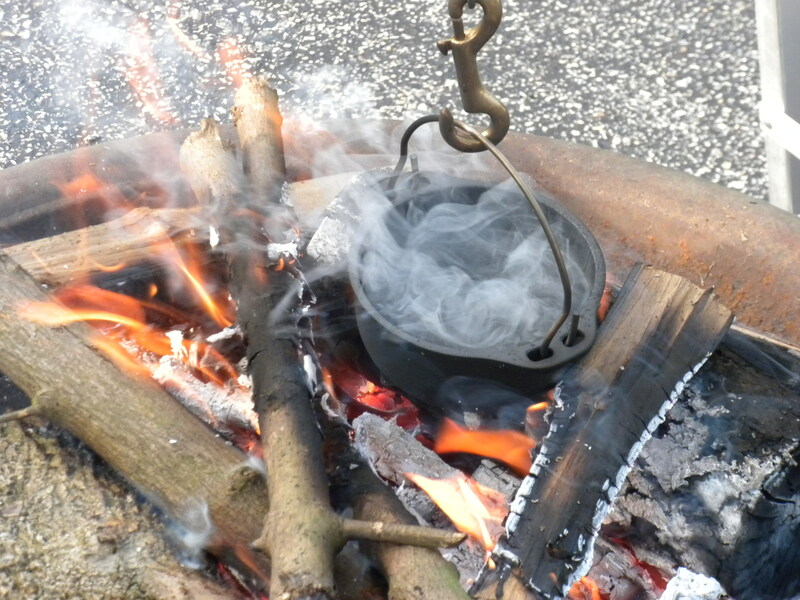 I checked the temperature often and moved the coals around to right underneath the cauldron unless it was boiling vigorously with a high temperature, and then moved the coals away. 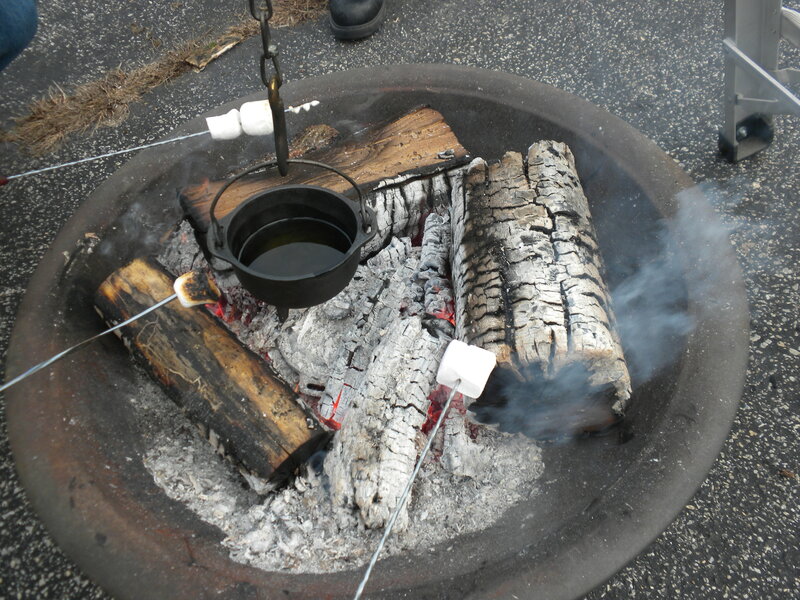 To pass the time, we toasted some marshmallows around the fire. 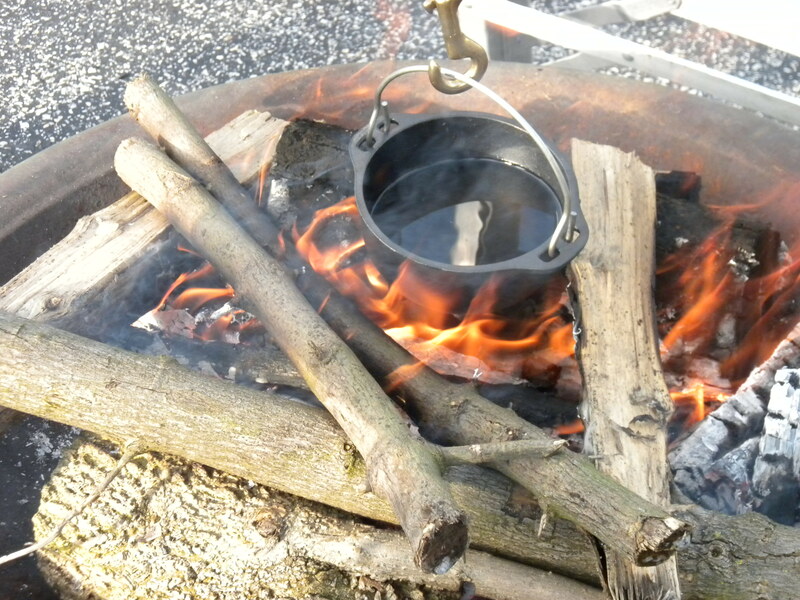 We had a second firepit setup, because I knew that there was a chance for problems with the linseed oil, so we had a separate fire for warmth and to cook on, but the linseed oil needed constant checking, so we had to stay close to it. The linseed oil, once it started boiling. At intervals, I inserted a metal stick into the oil to qualitatively check the viscosity. 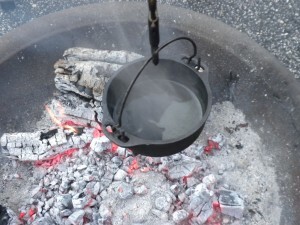 It took about 45 minutes once it started boiling to reach the desired viscosity, at which point I removed the cauldron from the fire and let it cool. At the point that that I decided the oil was done, there was a color change noticeable in the bubbles on the surface. They had changed from white to yellow. The final boiled linseed oil. At this point it was fairly dark out, so I needed to use the flash. Note the yellowish color to the bubbles. The final boiled linseed oil was a dark nearly opaque yellow/brown. Before boiling, it had transparent and a light yellow color. 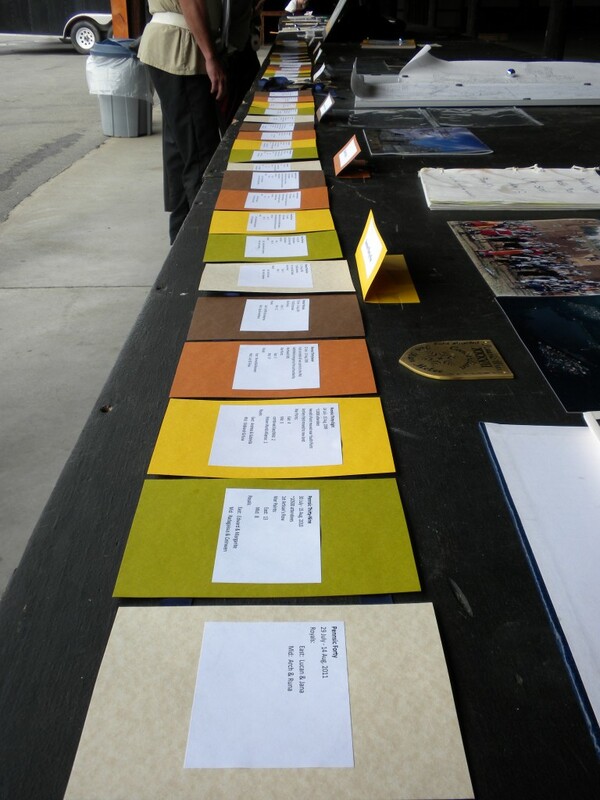 The color change may be in part from leftover carbon in the pot from the first trial. I wiped it out, but carbon black is hard to completely remove. Eventually, I will be adding lamp black to the linseed oil to make printers ink. I am hoping to make my own lamp black as well. The final boiled linseed oil. This jar had been put on its side and then put right side up, and you can see that the oil has not returned to level. It is very viscous stuff. 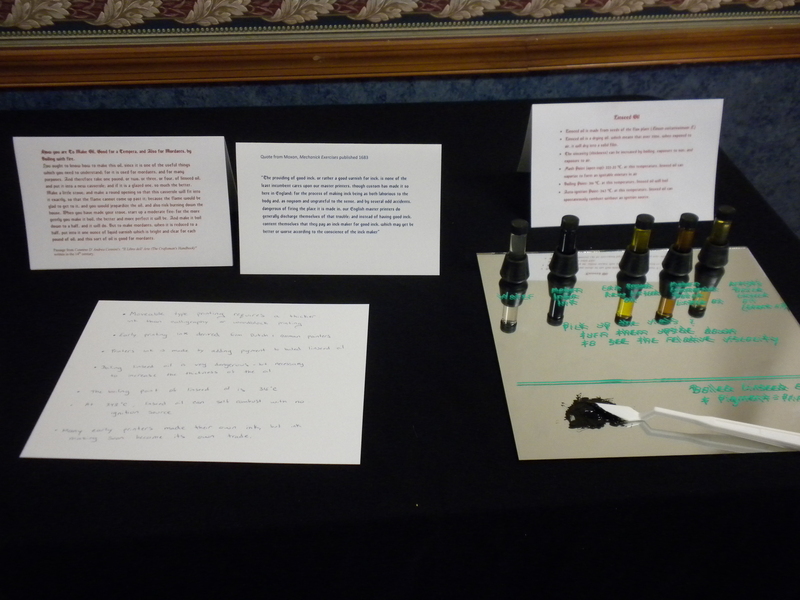 For the Delirus Mediaevalis Scientia Feriae (Mad Science Fair) event that was held this weekend, I put together a display on printing ink and linseed oil, as well as a demo on the printing press. For the ink display, I had 5 glass vials, each containing a liquid and a small ball bearing. I had a vial for each of the following liquids: water, modern India ink, raw cold pressed linseed oil (called flaxseed oil in the USA), commercially available “boiled linseed oil” (available at most hardware stores), and commercially available artisans boiled linseed oil (stand oil). When you picked up a vial and turned it upside down, you could get a qualitative idea of the viscosity of the liquid by how long it took the ball bearing to fall. Things I learned: no surprise, water and India ink have about the same viscosity. Commercial “boiled linseed oil” from a hardware store is actually just linseed oil with chemical driers added to it and has about the same viscosity as raw linseed oil. Artisan’s boiled linseed oil is very very viscous. The ball bearing took a long time to drop to the bottom of the vial. I also demo’d printing a woodblock on a hand press. I had made the press for Pennsic, and while it certainly isn’t period (it is built off of a bar clamp), the mechanics are period with top down pressure. 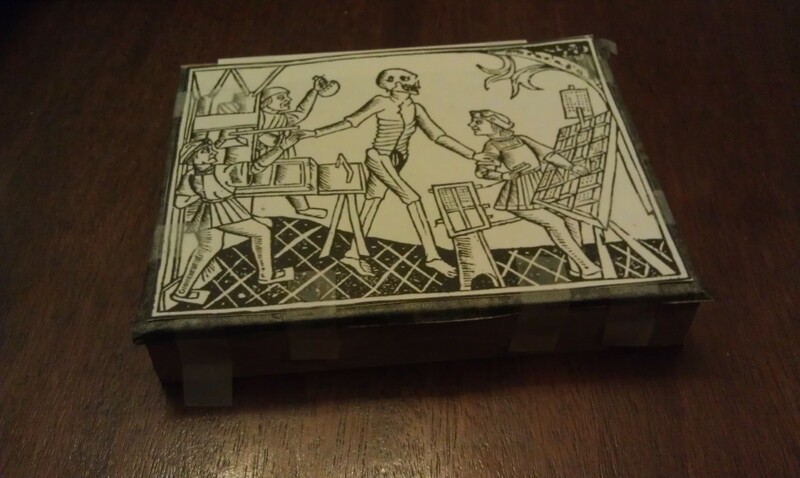 I had a lot of fun teaching about printing in Europe and letting people get to print little images of a medieval tent copied from a period woodblock. Someday I would like to make a small demo press that is actually modeled off of a period press. 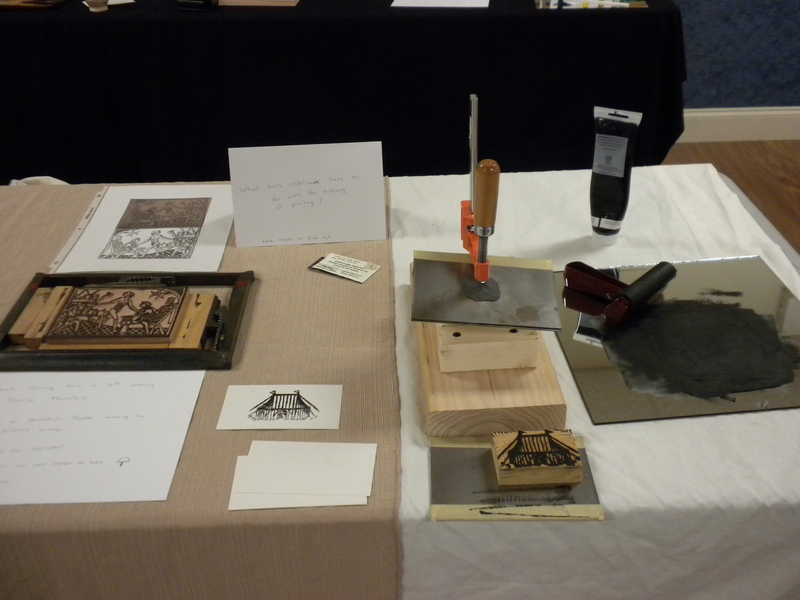 Setup for a printing press demo. People could come and print a small block with the image of a medieval tent taken from a period woodblock. 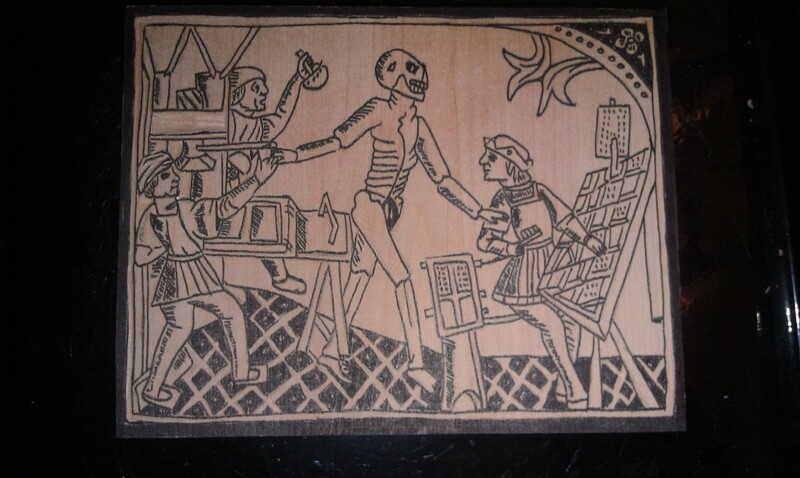 I decided to enter a woodblock recreation of an image from a 1568 Danse Macabre into East Kingdom King’s and Queen’s Arts and Science Champions. I was super pleased with the results, and I enjoyed the process. I was able to get the pear wood planed to type height, so I was able to print the block in my printing press. Largely to save ink, I disconnected the rollers and inked the block myself each time. I got really great reception for the project and a lot of great comments. At this point, I have a pretty substantial library on woodblock printing, so I was able to answer a lot of questions in details from things I have read. Here is the original image (on the left) and a photograph of my print (on the right). I used hot press Arches 100% rag paper, and it came out very well. 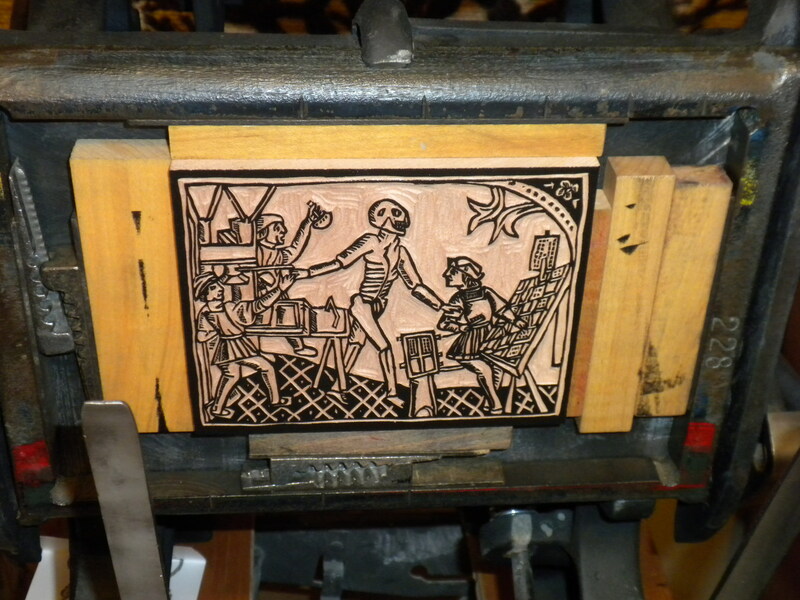 Here is a photo of the block in the printing press. Since we needed to enter into 3 different categories for the competition, I also did a food entry. I attempted to recreate an image from Gaston Phoebus’ Book of the Hunt. The image is of a picnic during a hunt. I made stuffed chicken (chicken stuffed with boiled egg yolks, parsley, and spices), a cheese pie, gingerbread, and sourdough bread. I redacted all of the recipes, apart from the bread, myself. I have never made bread on my own before without a breadmaker, and I have never used sourdough for anything. It was so exciting for me that I did it, and that it came out. I wasn’t sure if it was going to rise properly or not. I may do a food entry again, especially for something like Artisan’s challenge, but probably not for a big competition. I had a great time, got to meet lots of great people, and see some amazing artwork. I have already started collecting information for my next project. 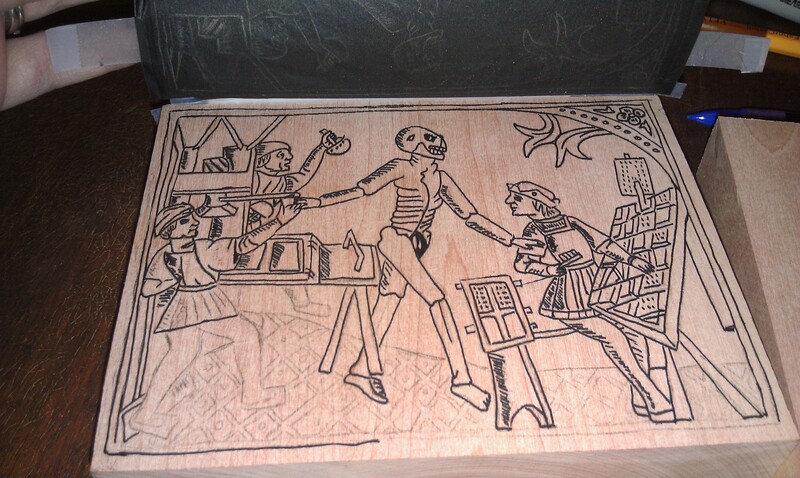 So the dance of death woodblock has been fully carved for the first time. Now I need to ink it, make some print, and see what final carving needs to be done. Generally there are areas that need to be carved deeper, or details that need to be enhanced. You can only tell what needs to be done after it has been inked and printed. Here it is. 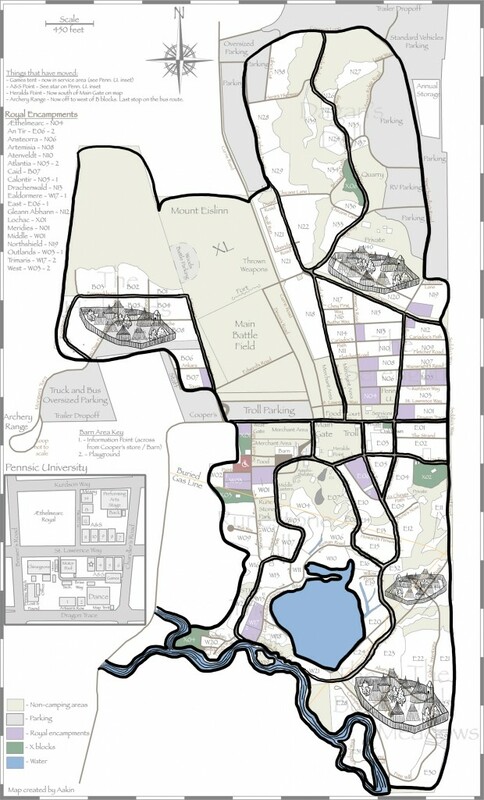 So I am going to have to put my Pennsic map project on hold. It is much to involved for me to work on while finishing up my Ph.D. I did get all of my pear wood planed down to 0.918″, which is American type height, so it will fit in my printing press, so now I am set for a bunch of smallish woodblock projects. I recently stumbled on a project that is perfect for me, and I am working on it for an event in a few weeks. It is from a Dance of Death and portrays the skeletal death coming to a print shop for the 3 men working there. It has an image of a printing press, the ink balls, the type case, and the galley. 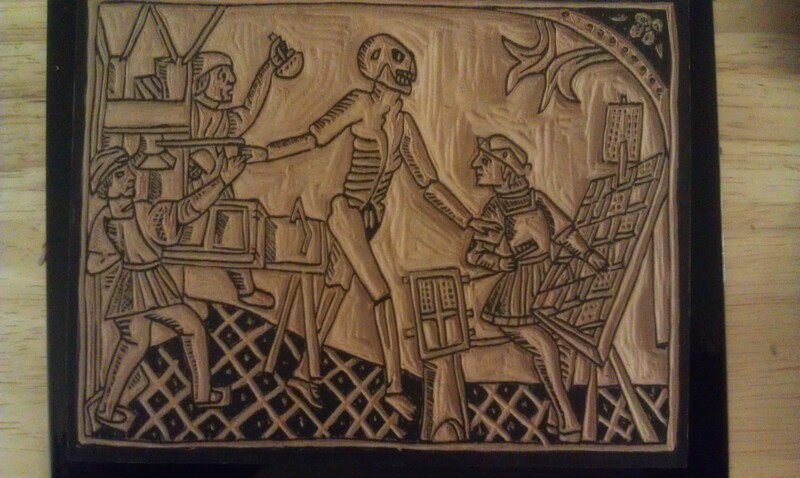 It is copied from a 1499 dance of death image, which is the earliest known image of the printing press. I could get more information about the 1586 print, and it has more details about the printing press, which is why I chose it over the 1499 print. Here are some pictures of how far along in the process I am. Here is the mirror of the original image taped to the woodblock over carbon paper, so it can be transferred. Here is the image on the block from the carbon paper before being penned in. Here is the image partially inked onto the block. I used a fine tipped Sharpie marker for this. 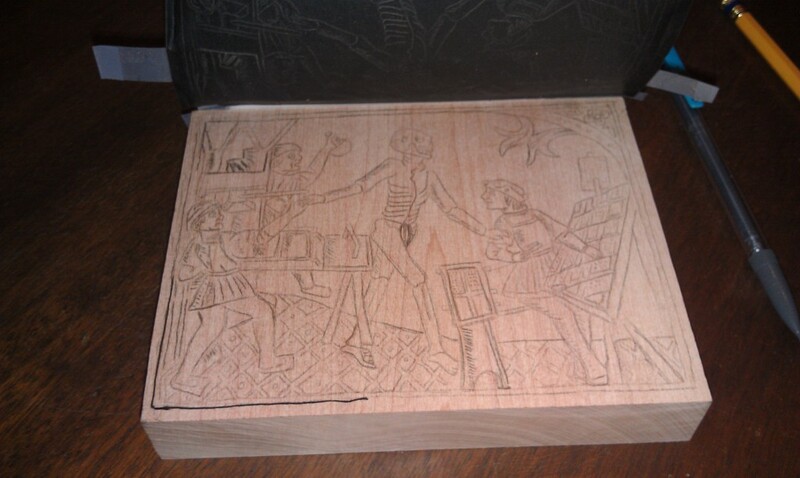 Here is the final image on the woodblock, waiting to be carved. It’s hard to see, but I have started carving a small section. 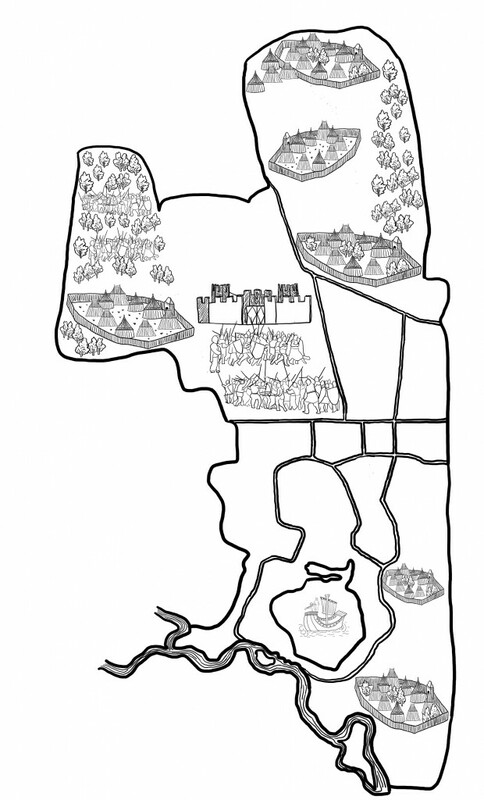 I have added in the castles for each of the royal camps. I thought there would be more space, but some areas are really densely packed, so the castles are pretty small. I got rid of the fences in camps, in part because they were too big, and in part because I didn’t like the way they looked. I may make some changes and add some back in. I am gong to fill most of the space with tents and see how it looks. I started with some tents, and also made the battle and fort smaller, but now everything is just too small. I also added in some merchant shops and the barn, and they are way way too small. They were also done very quickly, so the design isn’t great. If I can’t figure out a way to make this look good and be a decent size, I’m going to have to scrap the project. Thoughts? Here is the map without the base official pennsic map layer. I have added in the fort, the field battle, the woods battle, and a number of encampments. I am still debating what to do about the lake. Next up will likely be little castles for all of the royal encampments. 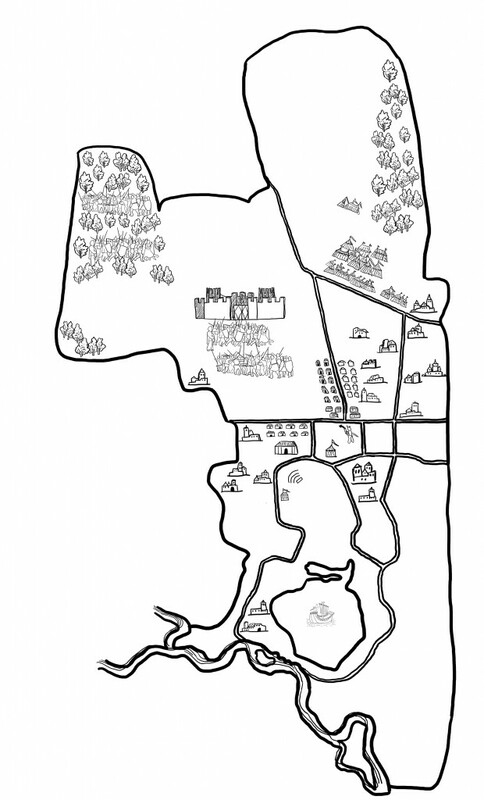 I have begun the design for a new woodblock project – a map of Pennsic. I intend for it to be very detailed and include battle scenes, archers, royal encampments and more. I am trying to make it in the style of Sebastian Munster. I do not know how to draw, so it is difficult for me to get it to look right. Here is a very early draft. I have left in the under layer, which is an official map of Pennsic. I am getting the location details from this map, and currently, I am debating whether or not to include the top chunk of parking in the outline or not. If I leave it in, I will just pretend it is more camping space, and fill it with tents. The original size I am working on is 20×34 inches at 300 dpi. I will have to shrink this down to around 6-8″ wide or so for the final map. I still have to figure out if I am putting in detail that is too small. 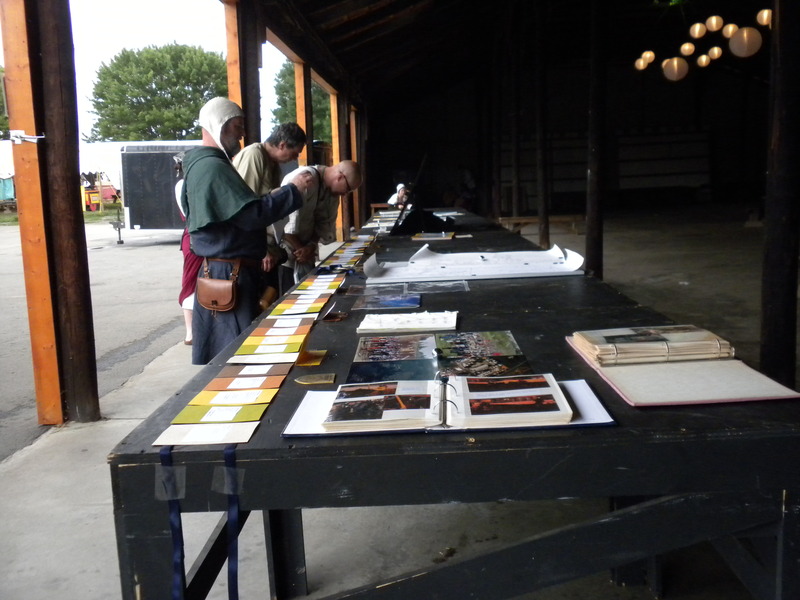 2011 was the 40th Pennsic War, and since I help out the EK Historian, I decided to do a history display at Pennsic. Since much of my time is spent working on my thesis, I was not able to dedicate as much time as I would have liked to the history display. Even so, I think it came together pretty well. 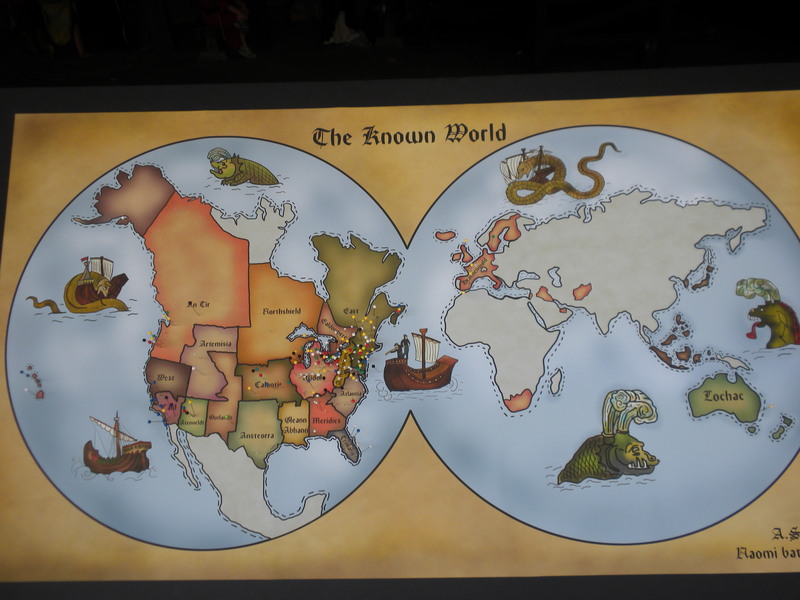 The main things that I put together were a timeline of Pennsic, all 40 years, and a current map of the Known World that people could stick pins in where they are from. The map I talked about in previous posts, and I got a lot of people stopping by to put pins in. By the end of the display, I had every kingdom represented, except for Gleann Abhann, although I know there were people at Pennsic from that kingdom. The timeline I was still working on as I was packing for Pennsic. It should be noted that my husband is amazing, and he did a lot of the last minute gluing. My husband doesn’t come to Pennsic (yet), but I sure put the poor man to work helping me get ready. 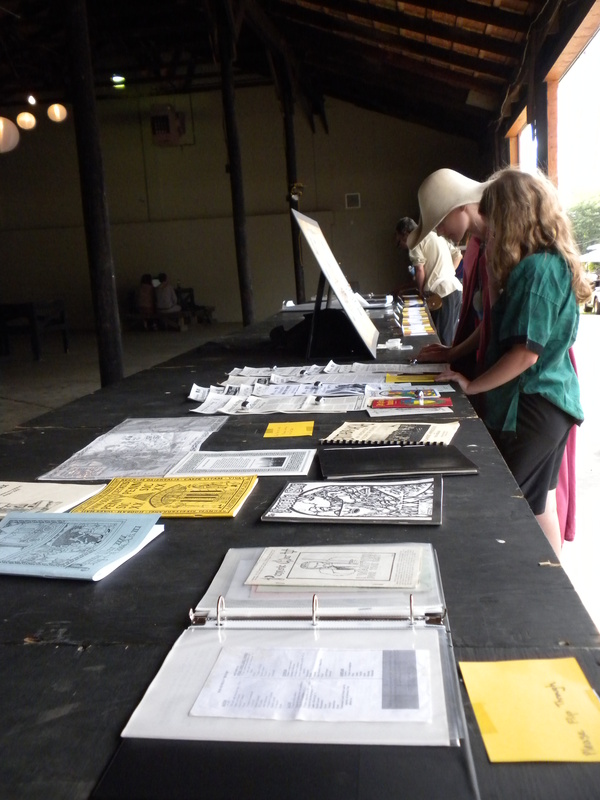 In addition, I had a number of old Pennsic newspapers, newsletters, photos, and maps. Some people brought by additional items to display as well (photos, maps, old site tokens, etc.). I was able to fill a pretty decent amount of space with the display, and it ran a good chunk of the length of the barn. I was pretty worried that no one would stop by or have any interest in the display, but I had a steady stream of people stopping by all day. It made my day when people came by and said they had been sent there by friends to see the display. I also made a blank book and asked people to write down their favorite Pennsic memories and stories, and I got some great stories. At some point, I will transcribe the stories and post them. I need to go back and carve the bowl of the spoon out more. The wall of the spoon is kinda thick, so its not as easy to use as I would like. 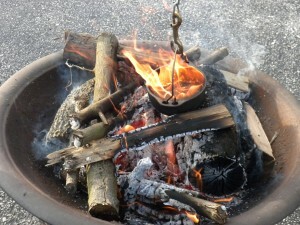 I was a lot of fun to have at the Beowulf event, and now I want to make some more spoons. I need to look up types of wood that are ok for food, since some can make you sick.